1 of 4 Allow turkey to sit at room temperature for 30 minutes before placing in oven. Remove giblets and neck (add neck to roasting pan, if desired); pat dry with paper towels. Heat oven to 425 degrees . 2 of 4 In a bowl, mix butter, parsley, thyme, rosemary, sage and 1/4 tsp of the salt until well combined. 3 of 4 Place lemon and onion inside turkey. Tie legs and place on a rack in a roasting pan, tucking wings underneath turkey. Season with remaining 1 tsp salt and 1/4 tsp of the pepper. Spread 4 tbsp of the herb butter on the turkey (refrigerate remaining butter; 1 more tbsp will be used to make gravy and the rest can be for another use). Roast on bottom rack at 425 degrees for 2 to 21/2 hours or until temperature in thigh reaches 165 degrees . (Cover legs with aluminum foil if darkening too quickly, but resist opening the oven too often.) 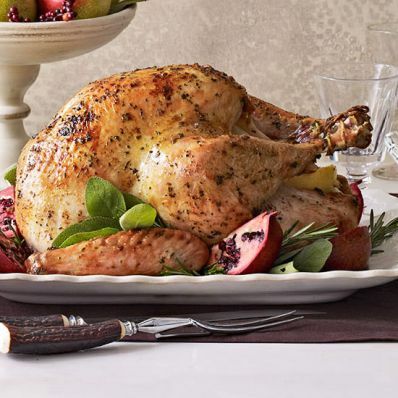 Transfer turkey to a cutting board and allow to rest for 15 minutes before carving. 4 of 4 While turkey is resting, make gravy. Place roasting pan over two burners on medium heat. Add 1 tbsp of the herb butter. When melted, whisk in flour. Cook for 2 minutes. Pour in stock and bring to a boil. Reduce to a simmer and cook for 3 to 5 minutes, until thickened. Season with remaining 1/8 tsp pepper. Serve alongside turkey.